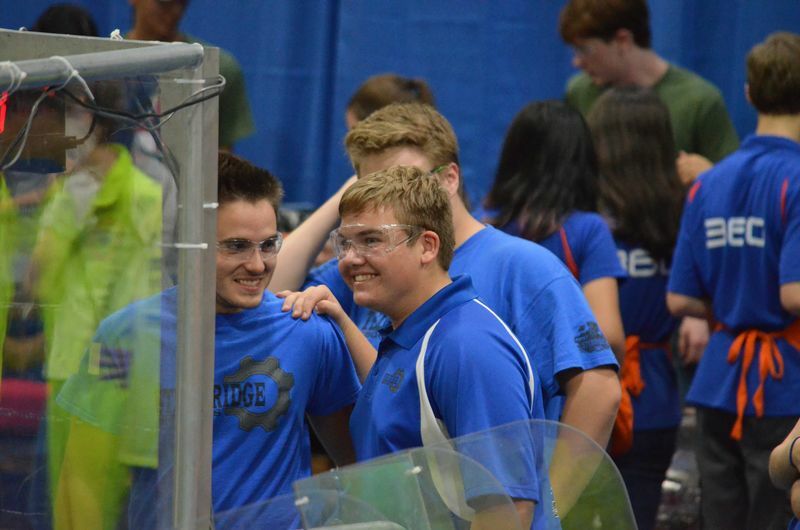 Ridgefield High School’s Steel Ridge Robotics team is revving up for another busy and challenging year. This will be the team’s second year of competition. In its first year, Steel Ridge Robotics (Team #6343) scored well in numerous qualifying rounds in the Pacific Northwest District’s robotic events held last spring in Wilsonville and Lake Oswego. The team also earned honors as “Highest Rookie Seed” and received the “Rookie Inspiration Award” during these events. These wins advanced the team to the district championship in Cheney, Washington. Had the team qualified in Cheney, it would have been among the 41 teams from the Pacific Northwest District to move on to compete in the 2017 FIRST Robotics Competition in Houston, Texas. An impressive first year in competition. The robotics competitions are organized by FIRST (For Inspiration and Recognition of Science and Technology) a not-for-profit organization based in Manchester, New Hampshire that designs accessible, innovative programs that motivate young people to pursue education and career opportunities in the STEM pathways (science, technology, engineering and math), while building self-confidence, knowledge and life skills. The competitions challenge high school students and their adult mentors to work together on a common real-life engineering problem—to design and build a robot in six weeks using a standard “kit of parts” and following a set of common rules. The project culminates in robotic competition where teams drive their robot in a sophisticated field game designed to bring out the best in every participant. Steel Ridge Robotics is coached by Jeff Brink, RHS physics and chemistry teacher. Assistant coaches are Steve Rinard, RHS teacher in math, engineering and computer science; Chris Shipp, RHS Woods/Metals teacher in the school’s Career & Technical Education program; and John Harvey, RHS English teacher who has previous FIRST Robotics competition experience. Team members have been busy in the current preseason. 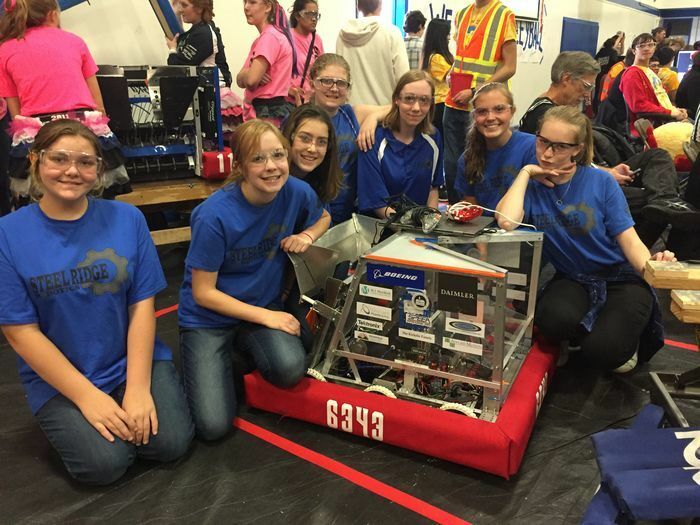 They recently attended FIRST Fair’s annual robotic workshop in Gladstone, participated in an off-season robotic event called Peak Performance in Seattle and supported their all-girls team at the Girls Generation Robotics Tournament in Portland. In December, the team will visit the Boeing facility in Gresham. Jake McCarthy (left) and Eli Holter (right) with Drive team coach Phillip Stryker (behind) at the Peak Performance competition held September 23. Drive team at the Girls Generation event (left to right): Shelby Bruhn, Stella Blystone, Caroline Ceravolo, Emily Davis, Olivia Waldron, Molly Holbrook and Ayla Davis. 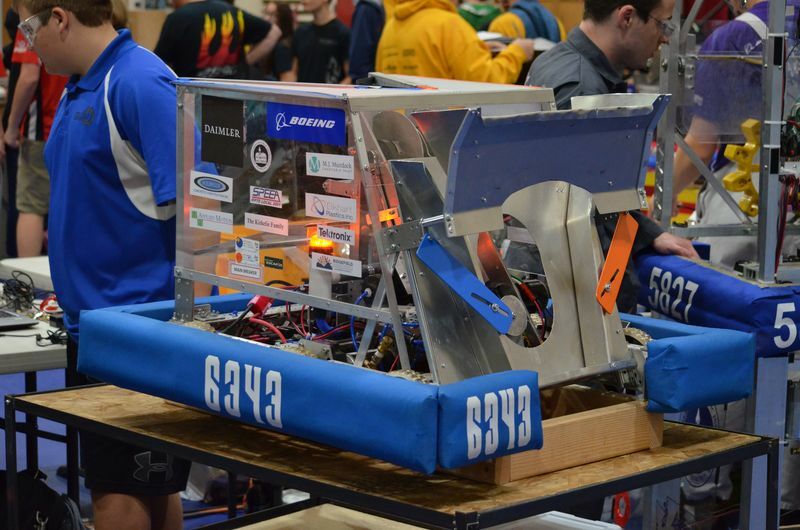 In early January, team members head to Skyview High School to work with Skyview’s robotic team, the Stormbots, at an event to kick off the robotic build season. There, they will learn to do some prototyping, hone their skills in game play and learn strategy development. More importantly, they will learn the rules and requirements of “Power Up” the new field game selected for this year’s competitions. Steel Ridge Robotics' robot for the 2016-17 competitive season. Starting January 6, the official start of the build season, the team will have six weeks to build their robot for competition. Competitions for the Pacific Northwest District will take place in Lake Oswego and Wilsonville this spring. Qualifying in these events will advance teams to the District Championship in Portland where they will compete to qualify for a spot in the 2018 FIRST Robotics Competition in Houston in April. Steel Ridge Robotics is grateful to the expertise of their mentors for support and guidance in the following areas. Chad Stryker, electrical hardware engineer at Tektronix, Inc. and Rich Recker, project manager at Autodesk, Inc. mentor the Controls team. Kris Holter, machinist/fabricator at Applied Motion Systems, Inc. mentors the Mechanical team. Rob Costa, systems analyst at Fidelity National Financial mentors the Programming team. Finally, Donald Nelson, fabricator at Boeing, mentors both the Drive and Mechanical teams. Team sponsors include the Office of the Superintendent of Public Instruction (OSPI), Boeing, Holbrook Concrete Construction, Inc., Elkhart Plastics, Inc., the Kirkelie Family, Applied Motion Systems, Inc., and Autodesk, Inc. If you are interested in sponsoring or mentoring the Steel Ridge Robotic team, please contact Jeff Brink at 360-619-1320 or jeff.brink@ridgefieldsd.org. Good Luck, Steel Ridge Robotics! Go Spudders!